Ever wonder why some of the Apollo lunar landing shots are a little out of focus? 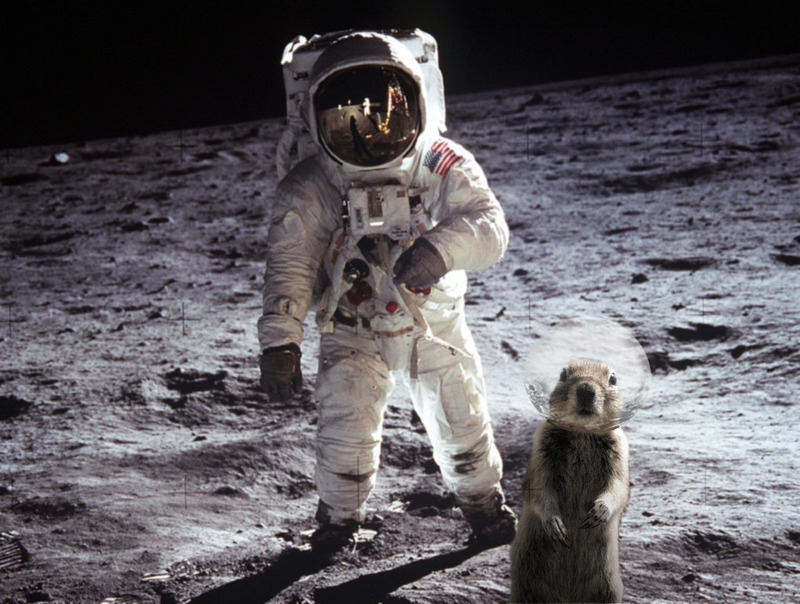 Ever wonder why chunks of photographs from the Moon have been cut out, leaving a a little squirrel-like shape behind? Wonder no more, even the Moon has a colony of ground squirrels (plus mini-space helmets, of course), ready to pop out of hiding when they feel the vibration of lunar lander thrusters, astronaut footsteps, and the whine of focusing cameras. This is one Moon conspiracy solved, once and for all! Don’t worry, I haven’t lost it quite yet, I’ve just been playing with Photoshop. This is in response to the wonderful National Geographic photograph of a curious ground squirrel that managed to pose for the perfect holiday snap in Canada’s Banff National Park. Now the image is going viral, with little squirrel cut-outs appearing in a huge range of photos and videos. So here’s my effort. The Banff Lunar Squirrel! 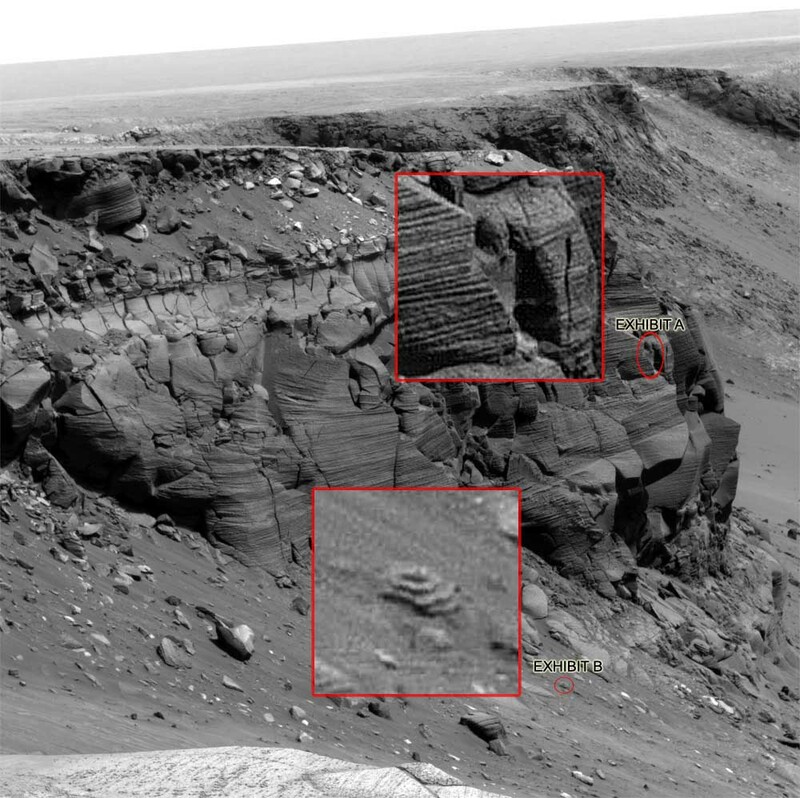 The two suspect shapes spotted by Mars conspiracy theorists. Exhibit 1: The Egyptian statue. Exhibit 2: ?? During my search for material for last week’s Wide Angle: Mars Roving on Discovery, I was looking for images snapped by the Mars Exploration Rovers (MER) Spirit and Opportunity. During my trawl around Google Images, I managed to find a high-resolution picture of the rocky outcrop on the side of Victoria Crater when Opportunity was imaging the area in 2006. I’ve always loved these Victoria images; you can easily see layering in the exposed rock and boulders strewn below. In fact, this could be a black and white picture of the Utah desert, or a wide angle view of the Grand Canyon. But no, this is Mars; lifeless Mars. One version of the Opportunity image can be found on a conspiracy website, where a ‘study’ has been carried out. And guess what they found? Oh yes, apparently a Martian civilization worshiped the pharaohs of ancient Egypt, carving a statue more commonly associated with pyramids into the crater wall (“Exhibit A” in the image above). Also, there’s a curiously shaped multi-layer disk on the ground — obviously some kind of alien artifact (“Exhibit B”). Normally I’d ignore something like this, but I thought I’d have a little fun one evening (because my evenings simply aren’t exciting enough, it seems). Inspired by Phil Plait’s visions of Miss Piggy in a Mars mesa last week, I wanted to test myself and go on a pareidolia hunt of my own, armed with the Victoria crater pic, my imagination and questionable eyesight. The human brain is a strange old thing at times, creating recognizable features out of random, inanimate objects, and that is exactly what some people use as “proof” of their nutty theory or visions of the second coming. 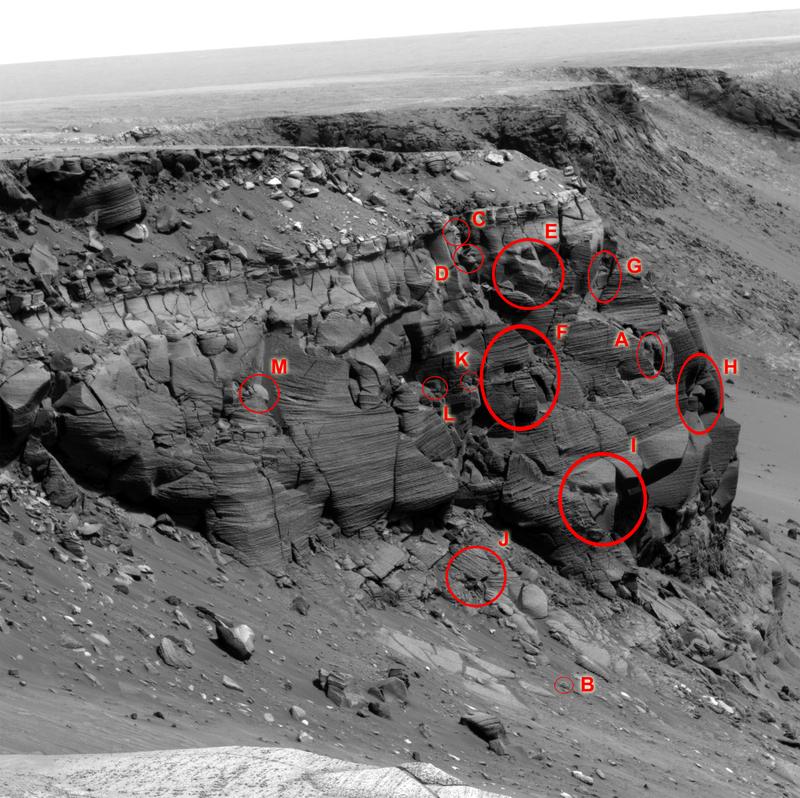 People see Jesus in burnt toast, Michael Jackson in cloud formations and, in this case, ancient Egyptian statues carved into crater rims on Mars. A: Exhibit A – the Egyptian statue. B: Exhibit B – some other artifact. C: Admiral "It’s a trap!" Ackbar from Star Wars: The Empire Strikes Back. D: Audry II, the blood-drinking plant from Little Shop of Horrors. 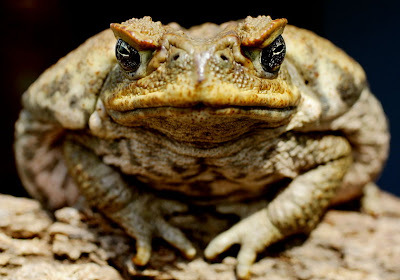 E: Jabba the Hutt, or an angry toad. 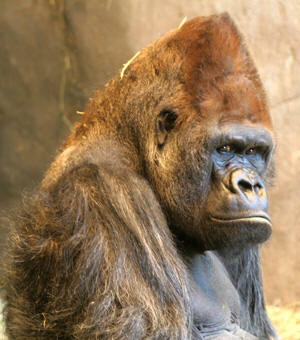 F: A gorilla’s head (kinda). G: Can’t remember what I saw in this… but it’s kinda alien looking… right? H: Insane-looking face. Could be the Mad Hatter? 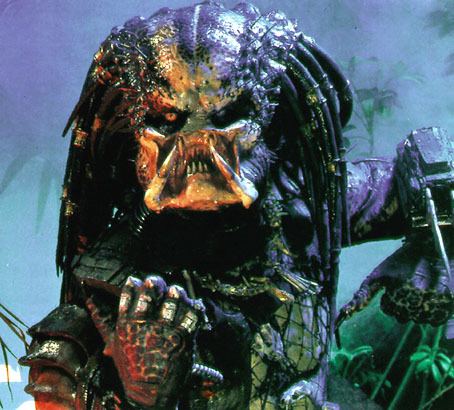 J: The alien from Predator. L: Another Egyptian statue, head part. I’ve even got a full-resolution version in case you can’t see the fruits of my imagination (all 4MB of it). But who cares if you can’t see Jabba, Ackbar, skulls or statues? That’s not the point; most conspiracy sites skew the facts to convince the reader to believe their false claims anyway. Hmmm… I’m quite good at this, perhaps I should start my own ‘Mars Faces’ conspiracy, only including characters from Star Wars… hmmm. I’m personally most impressed with the “humanoid skull” (M), “Admiral Ackbar” (C) and the “insane face” (H). Obviously the ancient Martian civilization were a part of the Empire (not so far, far away), carried out sacrifices on humanoids (bones now littering the plains), worshipped Egyptian kings and had killer rock sculpting skills. Obviously.